Many analysts have pointed the finger at the Algerian army and military intelligence agencies regarding the recent escalation between the Polisario Front and Morocco, explaining that the separatist front felt emboldened after Algeria handed its militias a large batch of weapons last March. The escalation started just after this delivery and climaxed late last December when the Polisario held military maneuvers in the buffer zone of Aghouinite, not far from the Moroccan defense wall, before it deployed armed militiamen in Guerguerat this January. On March 5, 2017, Algeria delivered to the Polisario a large batch of weapons, including Russian-made armored vehicles, among which the VTB-82A, equipped with 30-millimeter guns and 7.62-mm machine guns, BTR light armored vehicles, pick-ups and 4×4 vehicles, twin-barreled guns and rocket launchers. 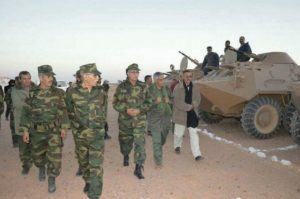 As the military parade of Aghouinite did not have the expected echo, the Polisario was encouraged by its Algerian mentors to escalate tension. It was thus pushed to deploy elements of its militias in the buffer zone of Guerguerat in a bid to disrupt the Sahara Desert Challenge Rally and the Africa Eco Race that were to cross the Guerguerat border post respectively on January 3 and January 8. The Algerian and Polisario leaders, who suffered over the past few months a series of bitter diplomatic failures, found no other way to exert pressure on the international community, as a new session of the UN Security Council on Western Sahara is approaching, than beat the drums of war. The 15 member-Security Council will actually hold a session in April to review the Western Sahara issue and make a decision on the renewal of the MINURSO mandate.